A. Bowdoin Van Riper. 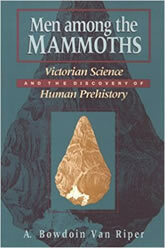 Men among the Mammoths: Victorian Science and the Discovery of Human Prehistory. University of Chicago Press, 1993. Van Riper recreates scientists’ first arguments for human antiquity, placing these debates within the context of Victorian science. Using field notes, scientific reports, and previously unpublished letters, he shows also how the study of human prehistory brought together geologists, archeologists, and anthropologists in their first interdisciplinary scientific effort. A vivid account of how the discovery of human antiquity forced Victorians to redefine their assumptions about human evolution and the relationship of science to Christianity.